Blogroll | Moving: UK to New Zealand? Are we insane? Well where do I start ……. House: We are buying a house! We have been looking at houses for ages and chose one that ticked more of the boxes than any other. We then found out that there was already another offer in on it. The situation here is a different to the UK as chalk is to the board that it squeeks on. Our offer went in the ‘pot’ with very few conditions to the contract. The other people had to sell their house to become un-conditional. In the present ecconomic climate, that was going to be difficult. So we had to wait 8 working days for a clause to come into operation and then we had the phone call saying that it will be ours on the 30th May …… that’s this year …… start to finish in 3 weeks! Ths is quite normal here so why can’t it be the same in the UK? We had to hand in our notice on the rental house before we knew if we had the other one. This was far from ideal but it seems to have worked out ok. There are 2 lounges so we hope for an almost toy free upper lounge. There are decks front and back, the down side is a smaller than ideal garden (terraced into 2 lawns as it’s on a hill (almost all of Auckland is on a hill …. for hill read inactive volcanic field)). Oh it also has a spa pool …. HA. Aidan: Aidan went to Starship Hospital (he’s been there a couple of times before for the same minor problem) on Monday and was in on Wednesday for a minor operation at Waitakere Hospital. Nothing to worry about but in a very sore area!?!? He is doing very well and has been a hero with everything from the general anesthetic to the bandage changes. Lisa: Lisa is finishing her work at the dentist. It was always only covering maternity leave but it was convenient and with buying a house a necessity. Still she has a part-time position with one of the dentists at a different surgery. Her boss will miss the sarcastic comments. Mine has black wheels though and a full race system with some sort of carb kit. It made the other one I rode seem like a Vespa! For those looking confused it’s a Honda VFR400R made in 1993 and voted as one of the best handling (cornering stopping etc.) bikes produced. It’s …. er ….. fun and ….. er …. sounds good too! Insurance (UK bikers wait …..) £110 fully comp with 2 riders and breakdown cover, that’s with no no claims discount as I have not had a bike for a couple of years. Work: I have a permanent roster position at Helensville. This is a rural area as you can see from the map. It’s a single crewed station, so just me then and covers one of the largest areas of a station in NZ. Today was day one for me. One job ….. three and a half hours for a mountain biker in the Woodhill Forrest. Things are going to be different for me with the need to think ‘out of the box’. It will give me time to study for further qualifications and become part of the community. Role on the next 12 months (minimum roster time allowed) or more. Welcome home Dad! Bye Agnes ….. Hi Natsumi. After almost 4 months in hospital my Dad finally went home (yesterday) to his lovely house in Colyton, Devon (also known as the Wet country instead of the West country). He had had a Stoke but is doing amazingly well. I was so pleased to chat to him on the phone yesterday morning. Mum has been very busy (understatement I’m sure) and has been amazing in keeping as calm as she has. The work-load has been immense for everyone and I’m just sorry that I was unable to help from the other side of the world. Roll on the next possitive step in a gradually improving story. This is one of the things that needs to be considered when moving such a long way …. what if someone is sick? Well it has been a very changable time for as all. On Monday (10th March) we said a very sad goodbye to Agnes, our Au Pair and friend. She had simply ‘run out’ of visa time. The kids have grown up knowing her and loving her. She was sad to leave not only us but New Zealand which had become her home (in her heart). She had a safe but very long flight back to the UK. Please keep in touch via Skype or whatever. On Wednesday (12th March) I picked up Natsumi from the airport. She has come to us from Japan and has very good English (even if she says that it is not), and has bonded with the kids. Her big test will be next week when she has a ‘full on’ week. We had a good drive around (from Mairangi Bay – our closest beach to Devonport and then dropping Aidan at kindy) which was a good 45 minutes. Natsumi was dredding this but in reality all was good. So we have an oportunity to sample some Japanese cuisine after some great Hungarian meals. Well I’m safe after the venture into the bush ….. Wow what a house, what a location. Ok here’s how it was …… the house in the bush is a definite no for many reasons. The lounge was the size of a bedroom, the bedrooms were smaller than the lounge and they were on 3 different levels. The only grassed outside are was about the size of the lounge and belonged to a neighbour?!? We could have considered it to be great for fitness levels as the hill that it is on is steep, even by Auckland standards. If it was wet, Torvill and Dean would have nothing on us. If you were driving down, then the splash at the bottom would be impressive but expensive. The other house I looked at was very good. There was a good pool, a garden of good size, 3 living areas, 4 bedrooms, 2 bathrooms and fruiting vines. There was no garage (clutter hiding place …. oh and car parking space), the kitchen was old as was one of the bathrooms. These in them selves are not big problems but add to the overall cost as they needed replacing. There is an HRV system (ventilation system, quite common here and a big benefit as it reduces humidity and cools or warms depending on settings) that the rental house would greatly benefit from as there is damp here. Today I bought the necessary stuff to give the cars a much needed oil change. The blue car (as it has been named) had one (allegedly) when I bought it over a year ago so it’s desperate. The red car has a fuller than full service history and can wait until next payday. Here’s to getting dirty (maybe tonight), now where is the fuel filter found on a Toyota Estima? It has been far too long really since I took the time and effort to write something new on the blog, so here goes. I have been on leave, not because I really wanted to, it’s the system here. You have to have 3 blocks off (a block is usually 2 day shift then 2 night shifts) together and at a time when they allocate them. I think it stinks but I seem to be in a minority of 1. I was asked by a colleague to change leave blocks (that’s allowed) and I agreed (thanks Geoff). It gave me time off when the schools are on holiday (summer hols here). We have all been doing lots of ‘stuff’. We have been swimming in the sea and Steve’s pool (thanks mate). Connor is slightly too confident, Aidan has gained lots of confidence this summer and gets knocked over by waves, gets up and laughs (all well within his depth). Liam has had a few duckings too; he is not so happy but gets back into the thick of it soon enough. Yesterday and today we have had some bush walks that were far closer to home than we had realised. We have started the serious look for a house. There are several reasons for this. There is the stability for all the family, the thought that paying rent is just paying someone elses mortgage for them (and it’s just gone up) and the ability to do something to the house (like hang a calender on the wall where we want it). Houses here are far more expensive than when I first came over. The increase has been amazing. Now we are facing several problems. The money from the sale of our UK house is STILL en-route here, the exchange rate is not in our favour and we are looking just a little further north than where we are at the moment (20 mins up the road ish). 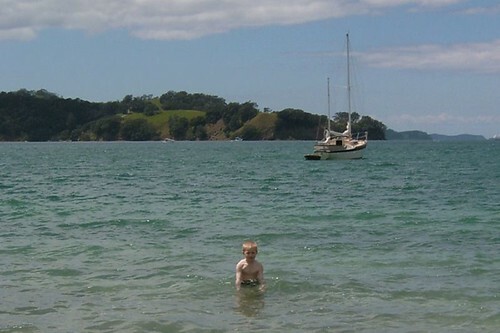 We live on the North Shore of Auckland which is probably one of the most expensive areas. Just up at Whangaparaoa it meets our budget a little better. The lifestyle there is even more relaxed (we have been told). Houses are a little different too. Unlike the UK where it’s odd not to have a brick and tile house, here there are maybe 20% of those, the rest are various building materials (no mud huts yet). At the weekend we saw this house, liked it and also decided that it wasn’t for us. Today I’m off to see this one (together with a couple of others), it will be amazing or terrible and without actually walking through the door it’s a tough call. I must go …. got an appointment with a real estate agent in the bush …… if I’m not back in a while ….. HELP! Well lots has happened since I last wrote. The all Blacks out of the Rugby World Cup followed by the Poms. Connor started school and loves it and Aidan starting kindy and enjoying it (he is shy though). So at home there are lots of changes to our days …… Connor is doing usual school day hours whilst Aidan is at kindy on 3 afternoons a week. Liam is enjoying his time alone at home too. It is a small chance not to be beaten up by his big brothers and to do what he wants and not what the others are doing. Liam is talking quite a lot in single words but mainly without the first syllable. It confusing and funny at the same time. Oots are boots, ooes are shoes but when they were getting some immunisations he was continuously saying doctor, very clearly. We had a trip out to Muriwai with its black sand beaches and vicious tides. Great for surfing and very good fishing (so I’m told). We walked up to the Gannet colony and around a short track through some bush. The kids enjoyed playing on the climbing frame / swings / slides etc. We went up to Mahurangi the following weekend which was good. There is a beautiful place called Sullivan’s bay which is next to Mita bay. Clear calm water, small (and large) islands and a great beach. We had an emotional time scattering the ashes of Lisa’s Mum and Dad. The boys were very good and Connor understood lots more than we had first thought as he asked lots of questions later. Connor went for a splash around in the sea as it was just warm enough, Aidan needed some encouragement and Liam jumped waves with me. We drove out towards the Waitakere ranges on Saturday in pursuit of a good walk (thanks Scotty for the loan of the book). We walked a track called the Auckland City Walk which, has nothing to do with a walk in the city! The track got it’s name because the city council saved the area from logging way back. The track crosses a small river twice and meanders along it’s banks through rian forrest. It was an hour of gentle ambling with the kids either hand in hand with me or Lisa. Liam took to the buggy for most of it but only really as he didn’t want to hold hands and there was a potential for impromptu swimming!?! Lisa had a great day yesterday. She had a long lunch in which she sat her driver licence test. Just the theory like I did. She passed both the car and bike test with no problems so she is all nice and legal. That’s one more thing to tick off the list of hings to do. Well it’s been ages and I’ll write in a while. I just wanted to share this with you all in case it’s just a Kiwi ad (probably is). Is it too ‘near the mark’ for the Pommie audience?